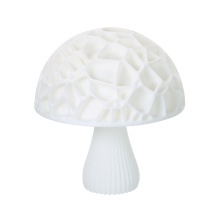 *3D Printing Technology: Print layer by layer, restore the real appearance of the mushroom. With the height 15cm/5.9in or 20cm/7.9in for choose. *Mushroom night light has 16 colors RGB, 4 light modes(flash, fade, strobe or smooth), remote & touch control model. It can gradually change the color mode with your remote control according to your requirement in different occasion. *The special light will add some warm atmosphere in your home and you won&apos;t feel lonely in the dark. With high performance LED light, more energy saving and environmental protection, good gift for your friends and families. *Food Grade Degradable PLA: Made of PLA material, which is extracted from corn stalks, non-toxic, odorless, safe and environmentally friendly. *Long Using Time: 500mAh built-in rechargeable polymer lithium battery, charge for 1-3 hours, use 6-10 hours. Standard USB charging port for PC, charger and mobile devices, etc.